My father, James Gray Waugh, served on HMS Formidable in the Pacific as an able seaman. My father passed in 2003. He always had fond memories of the friends he made and the comradeship of the Formidable's crew. 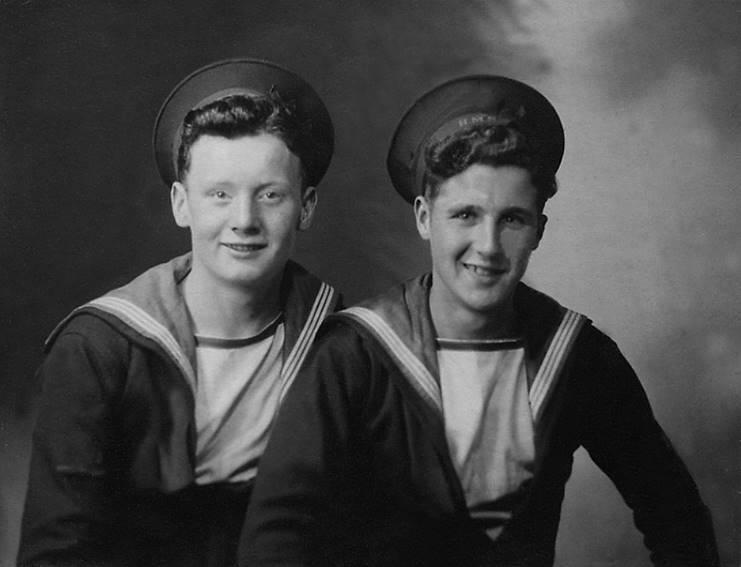 The attached photo is my father James Gray Waugh (on the right) with an HMS Formidable shipmate whose name is unknown to us. 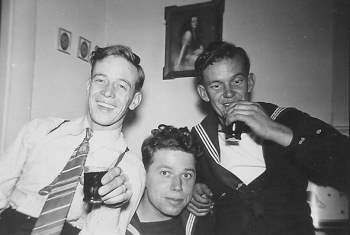 I am trying to trace details of my father Francis Davidson Hardie Brown who served on the Formidable during World War II. I believe he was a chief petty officer and I am trying to gather some info on him. He died some 30 year ago, but if anyone has any info on him it would be appreciated. Latest update Petty Officer Ernest Charles Nicholls service number P/J 99464 I have since found out he was mentioned in despatches for devotion of duty on HMS Formidable which led to the successful landings at Salerno (Operation Avalanche) does anyone know of this and has anyone got a photo of my late father in law please. Could you help me please,does anyone know of my late father in law Petty Officer Ernest Charles Nicholls who served aboard HMS Formidable 1941-44 he was mentioned in dispatches for something brave we think in the Italian landings. It's his daughters (my wife) our golden wedding anniversary this sept and I would love to give her information of her fathers Bravery. I just learnt that my late father, Donald Stewart Stark, from Glasgow was on the HMS Formidable from about 1943 till it returned to Portsmouth where he was demobbed. I believe he was a stoker in the engine room. I was always told he was there when the Japanese surrendered. I wonder if there is anywhere to confirm these facts? My dad died in April 1996 at the age of 73. Thank you for the work you are doing. I am looking for anyone who may have known my father John Nichol who served aboard HMS Formidable up until the end of the war in the Pacific. Dad served as a medical orderly so crossed paths with all ranks of shipmates. I am particularly interested if anyone has any photos of him during his 21st birthday celebration which would be 18th April 1946. I know there were photos of him with comrades and a cake the cook had made for him, we had a photo but sadly my Dad lent it to someone and it was never seen again. My father came from Boldon Colliery which was County Durham back then but is now Tyne and Wear. My mother and all family would be overjoyed if any photos of John could be found. Many thanks and bless every one of you brave men. 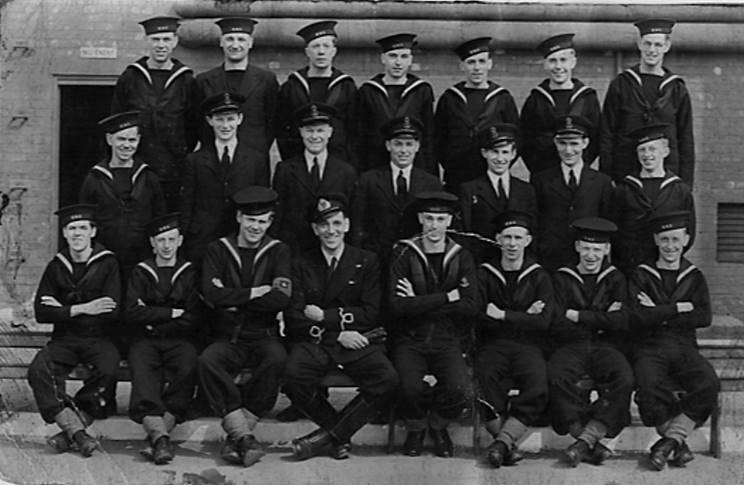 The below photograph of a group of ‘Geordies' on HMS Formidable from December 1945 may be of interest? Their names are recorded on the reverse. My father (now deceased) served as a telegraphist on HMS Formidable towards the end of WW2 (amongst other ships – he suggested all his other ships had been sunk!). The Boys "Geordies" HMS Formidable, Gibraltar December 1945. Front row left to right: AB. J. Smith, AB A. Todd, Stoker Osborne, Stoker J. T. Hunter, Telegraphist C. A. Niven. Center row left to right: SBA J. Wardle, SBA (illegible), PO J. T. Tomlinson. Top row left to right: AB J. Devine, PO F. Trouton, L/S S. Lowden, PO S. J. Watson, O/S W. S. Porritt, AB Bamage, AB S. Griffin. I've only just found this website as a result of the Daily Mirror article (Sat 16/5/15). 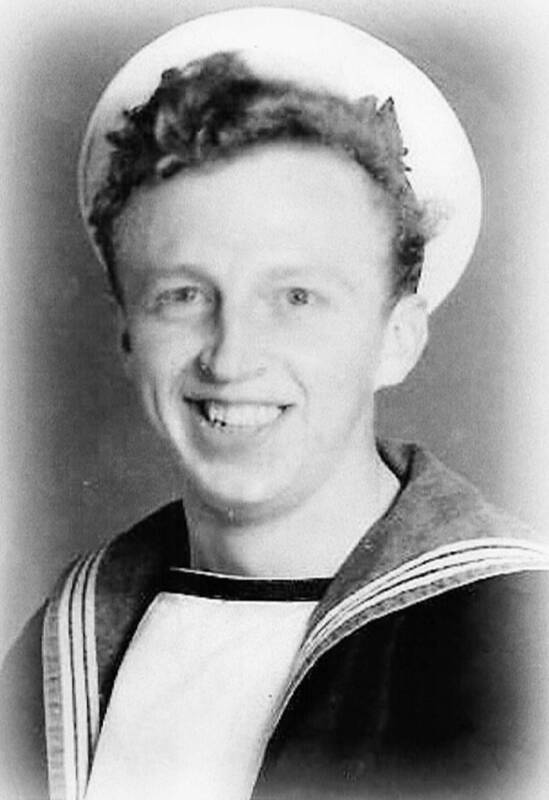 My dad Miles (Johnny) Hulmes served on the Formidable from 1943-45 and was onboard during the Kamikaze strikes and as it went into Sydney in 1945. I have a copy of the ships book, which my dad has owned since long before my birth, which has some of the photos on this website. Sadly my dad died, aged 88 in March 2013, but he would have loved this site. I wonder if he'd have recognised any of the names mentioned? God bless any survivors reading this. Please find attached photos of my dad from those days. Group photo, my dad middle row, far right. Can anyone else recognise anyone? 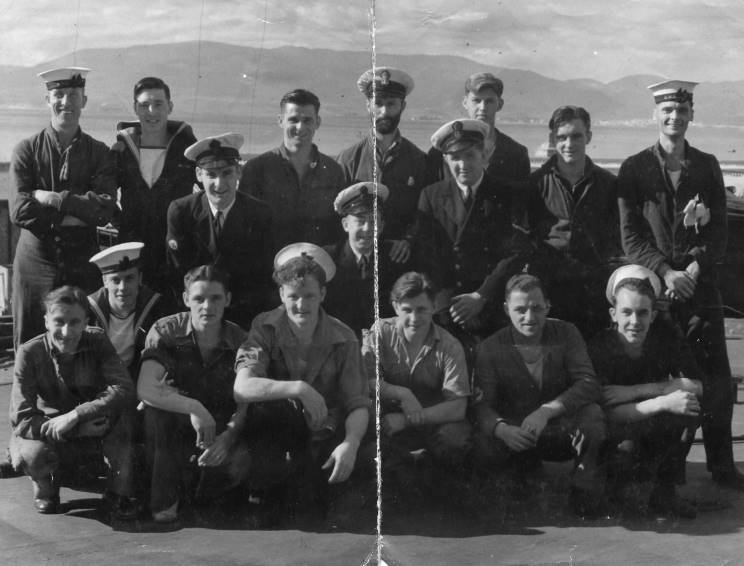 Does any one have any photographs of any crew, my father served on the Formidable for most of the war. His name was Henry Wilson from Newcastle. I would love to hear from you if any one knew of him, he passed away in 2004 and always wanted to know what had happened to any of the crew. I am trying to trace my late father's step brother, Leading Airman John Thomas Montague, who served on HMS Formidable from November 1940 until April 1941, he was awarded the Distinguished Service Medal in July 1941 Battle of Matapan, his Service Number was C/J72200, the above information is from his Service Record, does anyone know how he won the DSM and what happened to him as my father lost touch with him after 1945. 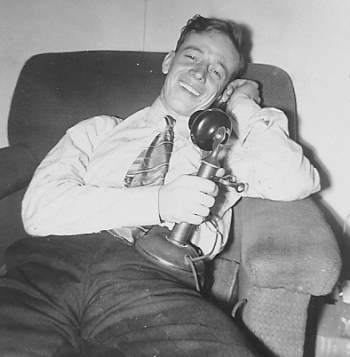 I found your interesting website and wondered if you could post a message for my dad, Fred Foley. His brother, Bernard Foley served on the HMS Formidable and was killed on 9th September 1943 on the deck of the ship when a plane apparently crash landed. He was only 18 and my dad, who is now 80 would like to know if there is anybody who knew Bernard and could give any more information about what happened. My name is William Woodgate (Bill) or "Woody" FX104355 I served on the HMS Formidable from 1943 - 1945 as an electrician. I'm looking for Stan Warren or anyone that knows him. Also anyone else that might know me. I'm Now living just south of Sydney in Australia. I have been going through some of my mothers pictures from WW2 and have found some pictures of a Sam Howard that was visiting with some other military personnel. I think is was in West Virginia, USA. My mother was from a musical family and she and her mother had an all girl orchestra that would play at NCO clubs for the military. They were picture bugs and took lots of pictures of all kinds of branches of service personnel. They also traveled along the East coast to perform so these pictures could be from anywhere. They even rented some rooms out for the military in Columbia South Carolina. I found several pictures of Sam Howard with the caption of where he served. It was taken on September 20, 1941 with my mother. Can you tell me if this is really a crew member? I would like to send the shots of him to family members not knowing if anyone has survived him. Both my parents are gone now and I can't ask any questions. Any help would be appreciated. Two photos of Sam Howard. My grandfather, William (Bill) Roland Foreman, served on HMS Formidable. He was the physical training instructor. If anyone has memories of him we would love to hear them. Sadly grandad died before I was born, he was only in his early 50's. He went on to be a very talented painter and after the war went on to teach PE at Winchester College.